3. Cover tightly and let the dough sit at room temp for twelve-ish hours. Then put it in the fridge for a while (a few hours, overnight, several days, doesn't really matter). 4. When you're ready to bake, turn your oven to 450 degrees (convection on if you have it), and put an enameled cast-iron pot (dutch oven) inside, with the lid on. If you don't have one, try any heavy-bottomed cookware (something that will retain a lot of heat). 5. 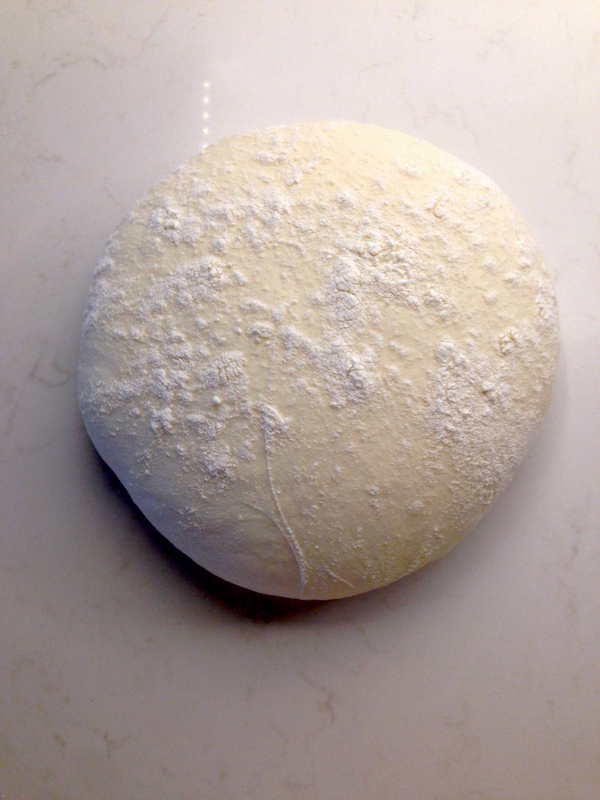 While the pot is heating up (30-45 minutes), pour your dough onto a well-floured countertop. Love your dough. Be gentle with your dough. Don't pound, knead, or stretch it. With flour-y hands (or a bench scraper), quickly fold the dough over once, rotate 90 degrees, and fold over again. Now (Gently! Lovingly! Sensually? 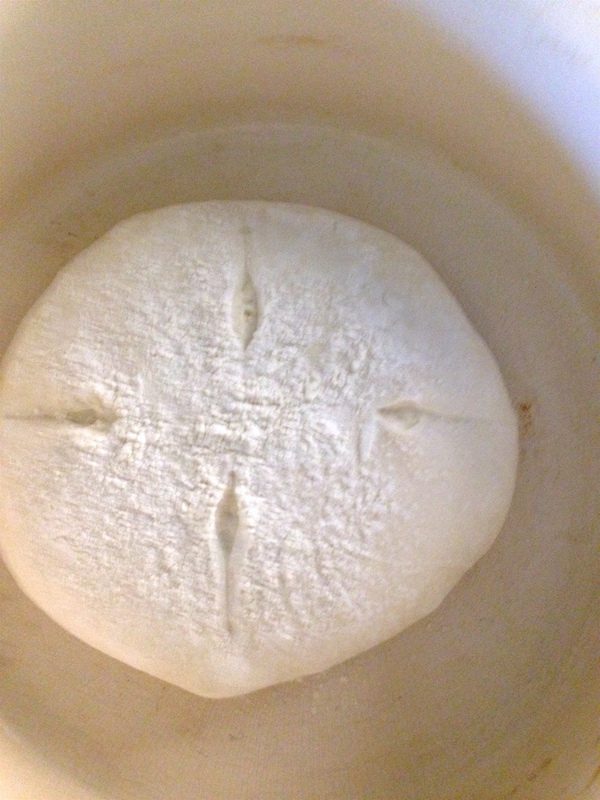 No, just gently is fine) work the sides of the dough down underneath it, rotating as you go, until it becomes a boule. You should be gradually stretching the top of the boule down underneath until you have a nice, smooth, round hunk of dough. 6. 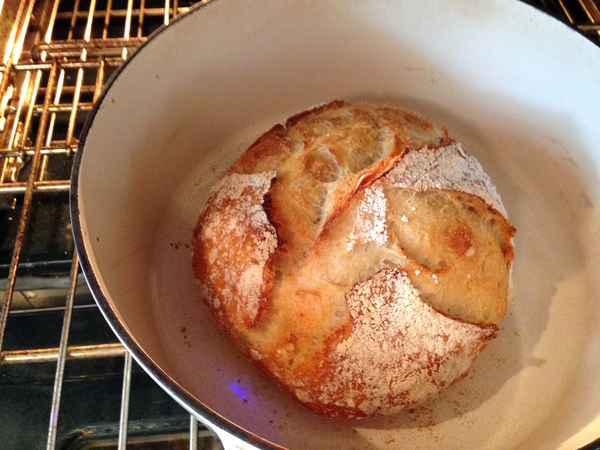 Take out the dutch oven and put the boule in. Use plenty of flour (on your hands, and dusted all over the dough) to make this easier. Should you burn your hands on the extremely hot cast iron? No! You should avoid that. Once it's in, make four quick slashes in the dough using a very sharp knife (or razor blade, or katana sword). Cover and return to the oven. 7. 30-or-so minutes later, check your bread. It should be mostly done springing up. Now you can remove the lid from the dutch oven, and rotate the pot for more even baking, and leave it in the oven another 30-ish minutes. Note the vague time indications; bread is done when it looks, smells, and sounds (and tastes) done. A timer is a crutch. 8. Wait for the bread to look and sound done (knock on the bottom, it should sound delicious and hollow but not dried out). Better to over-bake than under-bake it (if you're unsure). I wait for some of the wispy parts to start turning almost black/charred. 9. Take it out and let cool on a cooling rack, fending off your hungry children/spouse with the katana sword, saying 'Back! Back savages! Can't you see it's resting!?' Defend your beloved loaf of bread. That's it. Slice it nice and thick, spraying crispy crust crumbs all over the place. If you manage not to eat it all in one sitting, store it out on a cutting board, sliced side down, or in a paper bag. Ours never lasts more than 24 hours. 1. Ask someone else - I'm not an expert baker. 2. If your dough is way too sticky/wet to work with when you take it out of the fridge, try a little less water (I use 9oz. instead of ten). 3. Dough is too dense? Make sure you're handling it gently during shaping. Once it's out of the fridge, you want to keep as much air in it as possible. 4. Not enough initial spring? Make sure your oven is hot (at least 450, ovens vary a lot, even if the dial says 450) and that your pot has had enough time to really heat up. 5. Doughy/undercooked in the middle? I'm not totally sure why this happens, but I think it because the crust starts to set before the boule has had time to finish springing up. Also could be because the dough is too dry/tight, so it can't expand. Hit Command-Z a few times, or toss that loaf and try again. 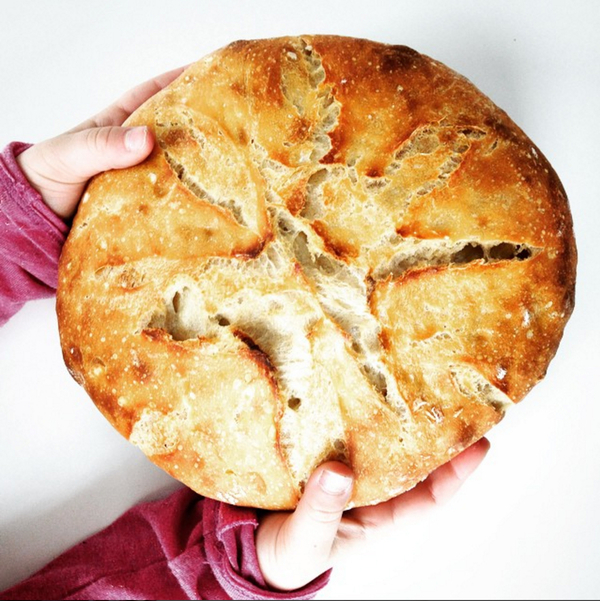 Are you an expert dough-slinger, or a beginning glutenphile? Let me know how your bread turns out, or what I'm doing wrong! Posting a bread picture in the comments is totally not dorky. Been making this since last year's post. I have a couple of recommendations. One, use fleischmann's yeast recipe for thick starter. Two, use a couple ounces more of flour and couple less ounces of water. I got so sick and tired of following Internet sourdough rules. The stuffs been around thousands of years. They did't have proofing boxes or gram measurements or scrapers or distilled water. I knead it until it feels like it should after a couple of rises, throw it in the pan I'll bake it in and let it rise once more. Score and bake. It may not look like every picture I see on the net, but if it's 190F in the center and it tastes awesome...I'm all over that. Turns out great every time. I have a licensed bakery out of my home and have been doing this for over 30 years (damn! I’m old!) I add more flour by gosh and golly. It is so easy. I grew up in Alaska on sourdough. This hits the spot! For those having trouble with moisture, make it a bit thicker. It thins out considerably with time as the wee yeasty beasties eat the flour and create lovely acids that make it sour yummylicious. Please, please, please at no point use a dough hook with this. @BR ahh! Sorry, I guess I misunderstood. Glad we worked it out. @bruno I was asking because ounces are both a weight measure *and* a volume measure in the imperial system. :) Thanks for confirming that you are using ounces by weight, and not by volume, though. I’ll be trying this soon! Hi BR - ounces are a weight measure (imperial system), while grams are a weight measure in the metric system. Hope you have a chance to make and enjoy this bread! I want to make this! Are the ounces weight measures or volume measures? I assume they're volume, but as someone who (very) recently got into sourdough baking, I've gotten used to seeing ingredients in grams. Thanks. It took a whole lot more flour and kneeding with my dough hook. 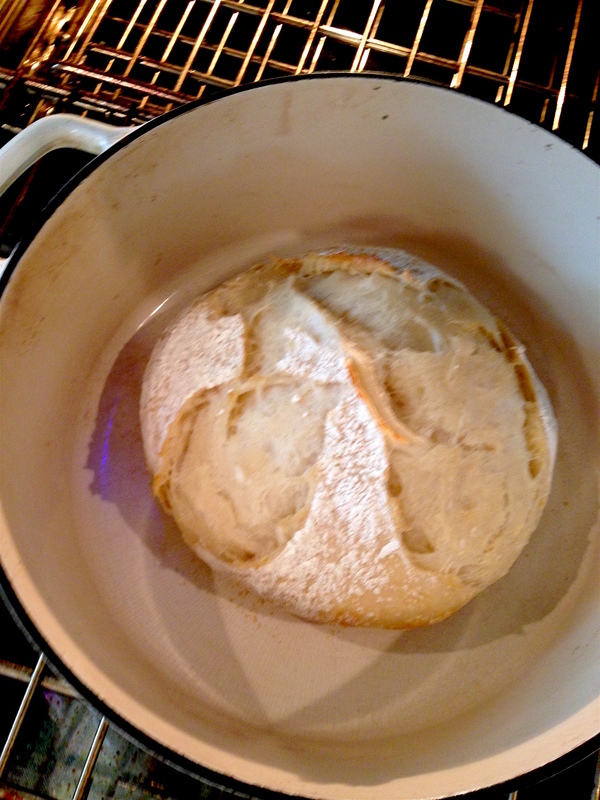 My Dutch Oven burn to a crisp...but the bread didn't turn out awful. The starter was fine---it had more to do with the rest of the ingridents. Oh well. I think I'll stick with what I know but thanks for the adventeur. Full disclouser I had often had issues with internet receipes so maybe it is me. As for the 'soupy part' - my starter does occassionally get a little watery on top if I leave it in the fridge too long. I just mix in the water and then feed it again and it seems to do fine. @katybeth sorry it didn't go so well for you! Maybe I just got really lucky with my starter, but I didn't do anything really fancy to get it to work. As I admitted, I'm not an expert, and the point of my post was only partly to tell people how to make bread (there's a vast amount of information on that online). The other part was (hopefully) to inspire some folks to try, seeing as how I've been able to do it, and I'm nothing special when it comes to baking. Let me know how your second try goes! I should have looked more closely at 1 in the troubleshooting part of your post—I kind of thought you were an expert at this kind of bread and teaching people to make it. 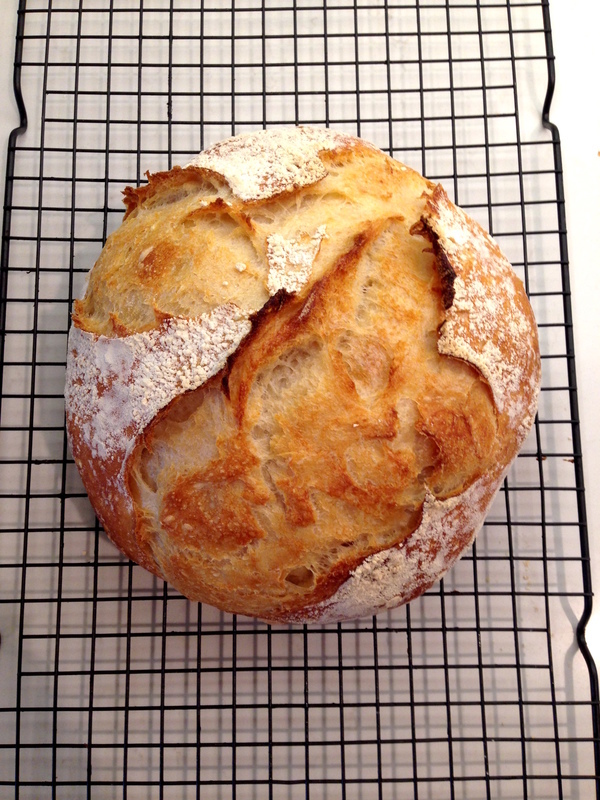 Bread is tricky—it’s good to write about what you know about…sigh. Oh well, there may still be hope. @jacob - thanks, glad you enjoyed it! A) this looks delicious, and B) the savages comment made me laugh. I could totally see the sword being necessary in my house to allow the proper rest time.